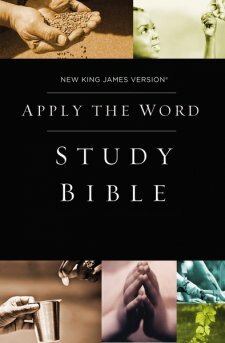 The Apply the Word Study Bible written in the NKJV is a very easy Bible to begin a study in. I found that each page has a section devoted to adding little bits of knowledge that you can add into your reading. These sections are fantastic for diving deeper in the word and a great place to get a jump start for further study. I also really liked that there are maps included in the book. We don't see that a lot any more with Bibles. I love to be able to look at them and see the correlation to modern areas as well. I like that it is hard covered as well. This adds a bit of classiness to the book. I love the overall feel of this Bible, and I highly suggest it to anyone looking to further their spiritual walk through study.